The work starts in the spring and continues through the fall. That’s when the District Department of Transportation (DDOT) performs annual street maintenance to keep the District’s roadways as close as possible to newly constructed condition. It can be a tall order depending on the type of winter the District gets hit with. Thanks to a dramatic increase in spending for roadway paving over the past two fiscal years, DDOT has been able to mount an intensified effort to improve city streets. 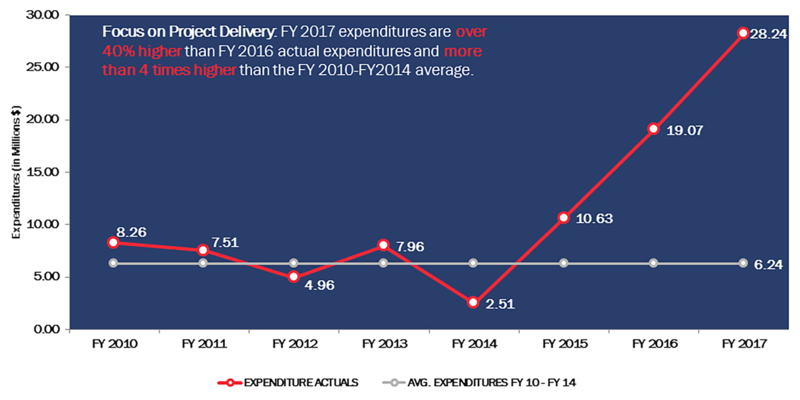 In FY 2017, DDOT spent over 40 percent more on street paving than it did in FY 2016. The agency’s commitment for street paving in FY 2017 was more than four times the average spending on street paving from FY 2010 to FY 2014. This influx of spending on the District’s roadways has led to tangible results. 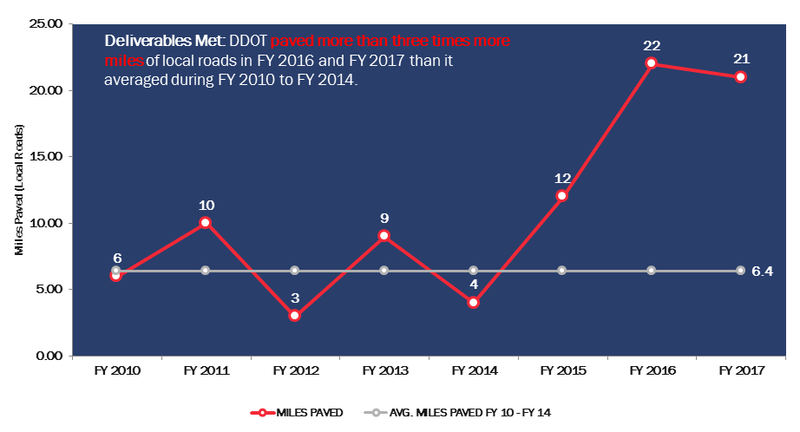 DDOT has more than tripled the number of miles that it paved in FY 2016 and FY 2017 compared to what the agency averaged in local road paving from FY 2010 to FY 2014. With the District redoubling its efforts to prioritize spending for street improvements, DDOT will continue to ramp up roadway repairs in the coming fiscal years. Moving forward, DDOT is set to further increase its focus on local street paving: The agency plans to spend $32 million to pave at least 23 miles of local roads in FY 2018. To see DDOT’s detailed paving plan, visit DTAP. The District Department of Transportation (DDOT) develops and maintains for the District of Columbia a cohesive sustainable transportation system that delivers safe, affordable, and convenient ways to move people and goods - while protecting and enhancing the natural, environmental and cultural resources of the District. This entry was posted in Infrastructure Repair. Bookmark the permalink. Glad DDOT Delivers is back!